This house in one of Houston’s oldest and most beautiful neighborhoods needed an update. 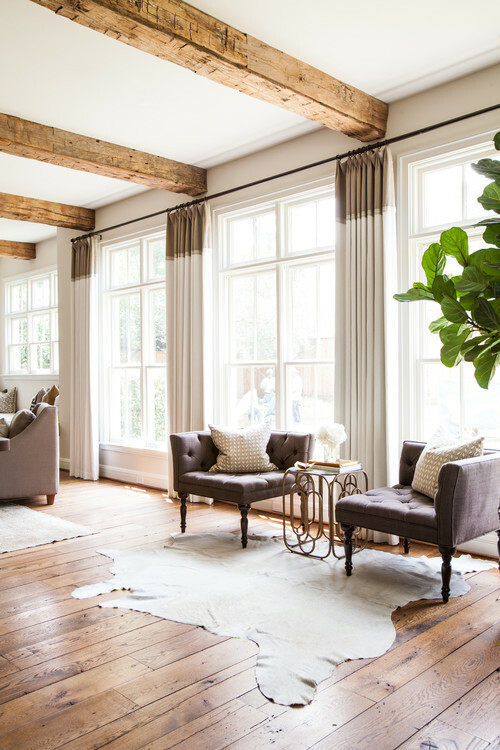 “My clients were looking to make it lighter, brighter and more welcoming,” interior designer Marie Flanigan says. The homeowners, a couple with young children, appreciated her background in architecture, as the scope of the work went beyond just decorating. She helped them swap around a few spaces for the way their family lives — adding built-ins for storage, placing new light fixtures in key places and creating a lovely freshened-up space that can stand up to the wear and tear of little ones. This large, open space was part of a previous addition not original to the home. Flanigan helped the family lay out the space for the way they live. This part of the space is a comfortable seating area complete with built-ins that conceal the TV. All of the fabrics are durable, as Flanigan chose washable indoor-outdoor fabrics for most of the upholstery throughout the home. 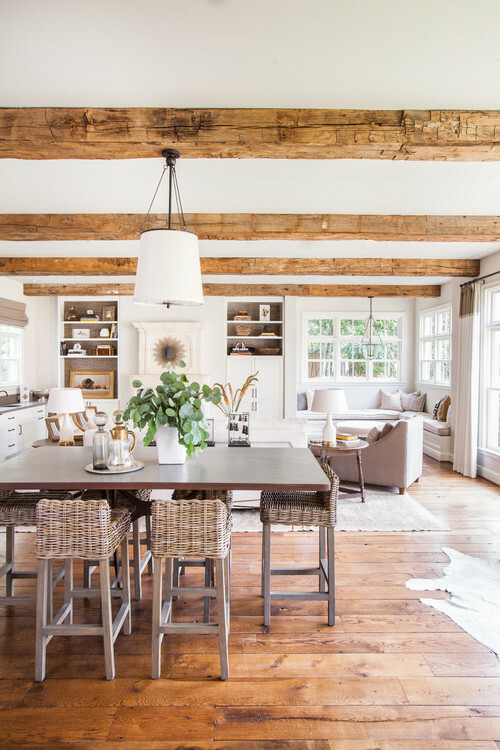 One of the homeowners also works in architecture and loves rustic wood, as seen on the beams, floors and oak parquet coffee table top. “It was about balancing the soft fabrics with these more rustic touches,” the designer says. The artwork on the left is made of cut paper. Flanigan redesigned this built-in window seat and custom ottoman, which opens up for toy storage. On the sofa table, boxes display the homeowners’ favorite collections of antique objects, such as pocket watches. At the back of the room, the cabinet doors on the left hide the TV and media equipment. The antique fireplace surround came from Europe. If you look closely at the wood-framed chairs, you can see a very subtle ikat pattern. The rug is a beautiful antique Oushak. 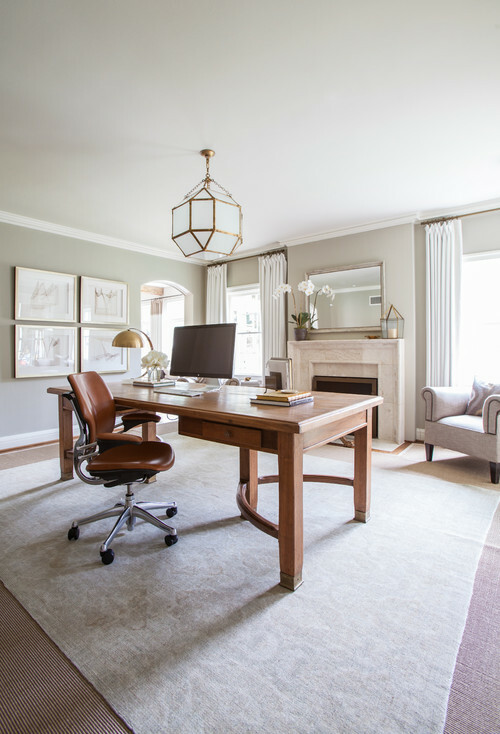 “She wanted a space where she could really spread out her architectural drawings and keep an eye on her children at the same time,” the designer says of one of the homeowners. This high table has a clear view through the entire space. Woven natural fibers also play a part in the welcoming textural palette. The chairs here bring in wicker as well as driftwood textures on their bases. To the right of the table, two tufted salon corner chairs make a spot for enjoying intimate conversation and a cup of tea. The table has an antique mirrored top. To make the home’s floor plan work better for the family, Flanigan flipped a few rooms around. This room used to be the formal dining room but now serves as a study. It is next to the great room and kitchen. In here, she replaced the existing ornate fireplace surround with a more streamlined one, made of vintage travertine. Flanigan transformed the breakfast room into a comfortable lounge (this shot was taken from where a sofa sits). It is open to the kitchen, so the homeowners can cook while their kids play and watch TV here. New built-ins offer plenty of space to stash toys, games, media equipment and books. 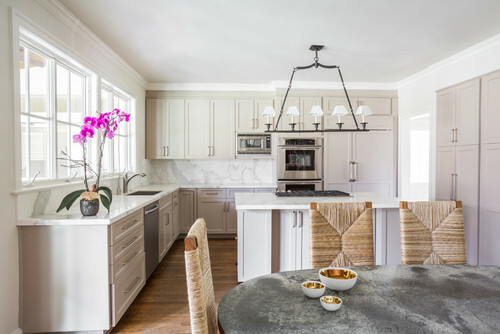 In the kitchen, the textures are a mix of Calacatta Gold marble countertops and backsplash from the same slab, rush seats, a bronze chandelier and a weathered zinc tabletop. 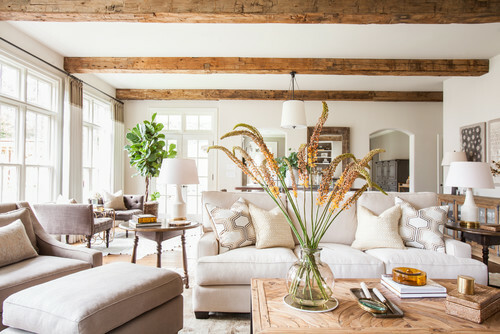 “We love to add organic textures to a room — they add a contemporary touch that really freshens things up,” Flanigan says. The formal dining room used to be the formal living room, a space the family, with its casual lifestyle, didn’t need. The custom trestle table has a diamond-patterned oak top. The chairs are two-tone, with ring handles that are strong enough to allow pulling the chairs out without touching the fabric — though Flanigan used indoor-outdoor fabric, again, so they can stand up to the harshest of Cabernet-spilling debacles. 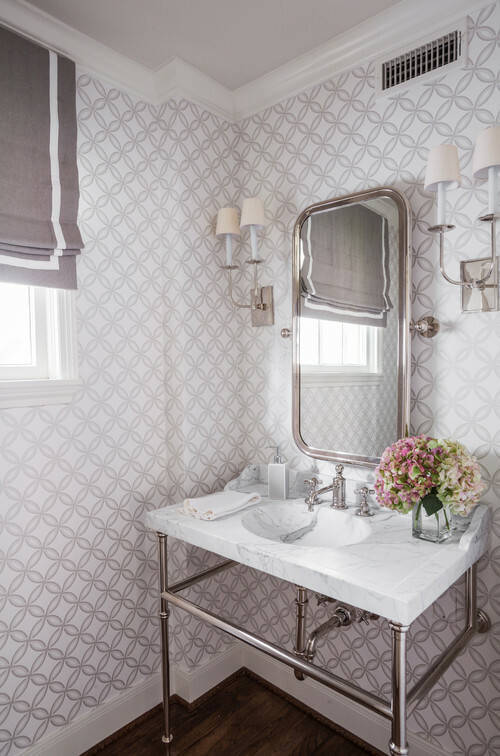 “In the powder room, I wanted to bring in something special and geometric that was kind of mod but still elegant and glamorous,” Flanigan says. She found just the thing in this wallpaper with a metallic silver pattern. The sink and counter are cut from one Calacatta Gold marble slab. The mirror pivots and adds dimension to the wall. 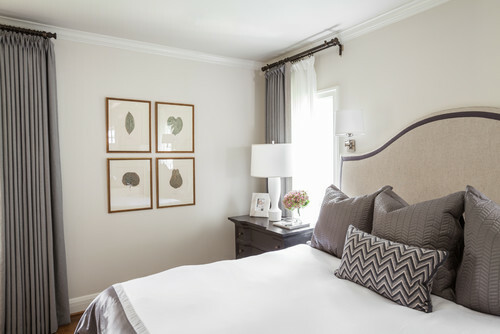 “In the master bedroom, we wanted to make it masculine and tailored but with a feminine feel via soft, inviting linens,” Flanigan says. 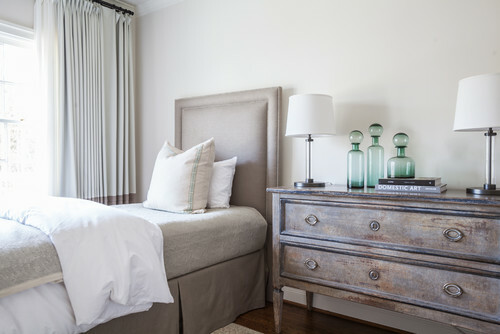 Silks, linens and cottons make up a luxurious bed, while neutral colors create a calm space. The artwork is pressed leaves. 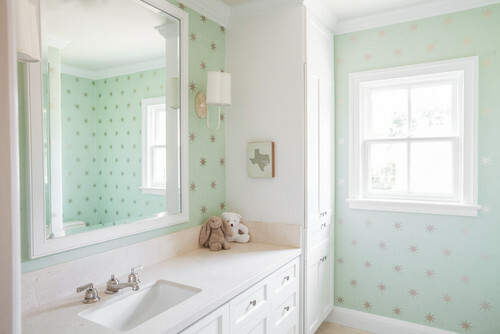 The bathroom has the same wallpaper as the nursery ceiling in another color and in vinyl, which can stand up to moisture. In one of the guest rooms, which will eventually serve as another children’s bedroom, Flanigan brought in some color via green bottles and celadon drapes. Again, the room is crisp and tailored, with elements like the patinated wood on the chest bringing in some weathered age. Flanigan maintained the house’s gracious appeal while updating it to a soft, light, bright and more inviting home.